The California North Coast (Bay Area) Travel Guide is a resource for Bay Area visitors who wish to sample the beautiful California coastline without extensive driving. The North Coast features exciting scenic drives, great hiking, beautiful beaches, rugged cliffs overlooking the ocean, redwood forests, quaint towns, bed and breakfasts, mountains, and historic attractions - all within a two hour drive of San Francisco. Place your mouse pointer on any place name on the map. A brief description will appear. Click on the box for a link to detailed information. For easiest use, scroll map to top. Detailed North Coast Map in separate window. The Marin Headlands is the largest and perhaps most diverse unit of the Golden Gate National Recreation Area. It features great scenery, numerous historic sites, beaches, a historic lighthouse, camping, a network of hiking trails, a youth hostel, and a variety of other programs within the park. It is very convenient to San Francisco, just north of the Golden Gate Bridge. Directions and Visitor Center. Main entrance is via Bunker Road. Take Alexander Avenue, second exit off US-101 north of the bridge (or last Sausalito exit coming south). The Visitor Center is three miles west and offers information and exhibits. Open daily, 9:30-4:30, except December 25-26, phone (415) 331-1540. Alternative is the scenic Conzelman Road, first exit north of the bridge. Road becomes one-way and narrow after Hawk Hill. Larger vehicles can reach Bunker Road via McCullough Road. Marin Headlands Area Map - (17 x 22 inch map PDF file). Conzelman Road. This is the most scenic driving route in Marin Headlands. It climbs the south edge of the headlands overlooking the entrance into San Francisco Bay. As you climb there are progressively better views of the Golden Gate Bridge and San Francisco. There are numerous scenic turnouts. Also, most of the old gun batteries are emplaced along this road, as they were obviously intended to protect the harbor entrance. There are pullouts or short trails to several of the emplacements. Beyond the Hawk Hill battery, the road becomes one-way west and becomes very steep, narrow and winding. Larger vehicles should turn back and use McCullough Road. Conzelman Road soon reaches Field Road where there are parking areas and access to Bird Island Overlook, Point Bonita Lighthouse, several gun emplacements, and the Nike Site. Point Bonita Lighthouse. (PDF file) The historic lighthouse is open for visitation Saturdays through Mondays, 12:30-3:30pm. Access is by a somewhat steep half-mile trail starting at the Point Bonita parking lot, junction of Conzelman and Field Roads. Rodeo Lagoon and Rodeo Beach. Continue past the visitor center on Bunker Road to reach Rodeo Beach. The lagoon is behind the beach. A 1.5 mile loop trail surrounds the lagoon and also accesses the beach. You can also just leave your car at the visitor center and get right on this trail. This area is popular for hiking, beach-combing, bird watching, and picnicking but not suitable for swimming. Leashed dogs are allowed on the trail and the beach. Historic Forts. There are three historic forts on Marin Headlands, and they are accessible for touring. Fort Cronkhite is a World War II era military post adjacent to Rodeo Beach. Fort Baker is an old army post dating to 1905. It is located east of US-101. Access by the Alexander Avenue exit. Fort Barry dates from 1908 and consists of the various buildings and batteries around the visitor center and Point Bonita. The visitor center is actually in one of the old fort buildings. Nike Missile Site. The missiles were intended as a defense against Soviet bombers during the Cold War. The site has been turned into a museum. Access is by guided tour, Wednesdays through Fridays, 12:30-3:30pm. On Field Road, about a half-mile beyond the visitor center. Tennessee Valley Trailhead. Located in the interior of Marin Headlands, this trailhead offer convenient access to numerous trails. Access is from the signed turnoff off of Highway 1 just west of the US-101 turnoff. For trail details (including where dogs are permitted), view the Marin Headlands/Fort Baker Color Map - (PDF file). Marin Headlands Camping and Marin Headlands Hostel Lodging. The four campgrounds in Marin Headlands are walk-in and by reservation only. Two campgrounds require trail hiking to reach. The other two are a short walk from Conzelman Road. None has more than five sites, so reservations should be made well in advance. A youth hostel is available in Fort Barry near the visitor center. Note: Some of the links in this guide are to publications in PDF format. The PDF's can only be viewed or printed using Adobe Acrobat Reader (available free, online). The California North Coast offers a wealth of scenic beauty, recreational opportunities, historical sites, and cultural sites. 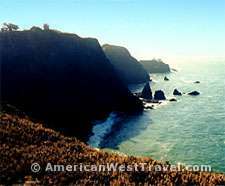 It features rugged cliffs overlooking the ocean, pristine beaches, redwood forests, and mountainous terrain. You can drive exciting scenic routes or hike on the plentiful trails. Scenic California Highway 1 is the main route along the north coast. It leaves the US-101 freeway just north of Marin City, winds its way to the coastline and heads north to the town of Tomales on the north end of Tomales Bay, then continues north for many more miles. It is only about 55 miles from San Francisco to Tomales via Highway 1.